I finished the Pea Pod Sweater. It took me a week to knit the 12 month size, and I probably would've finished before 2pm today if I hadn't had horrendous back pain all week. So yesterday, I buckled down and finished knitting and seaming while watching the X-Men trilogy, and woke up early today to weave in ends and add the buttons. Yarn: 4 skeins Debbie Bliss Cotton Cashmere, Strawberry, #15024 from Elann. Needles: US4's. Spot on for gauge. Started: 10/30/06 Finished 11/5/06. Buttons from Joann Fabrics. When I read the pattern, I just couldn't believe the sweater called for 7 skeins of Debbie Bliss Cotton Cashmere. Impossible! I knit the Debbie Bliss Tennis Sweater in the same yarn, and I think I used 9 skeins, or maybe less. So let me tell you all right now...I used 4 whole skeins. Four skeins, including all seaming and adding the buttons too. So I have three skeins left over, and depending on whether Seth's SIL will have a boy or girl, I may need to knit another one of these sweaters. The pattern was written very well, and it was relatively simple. I took these pictures in my yarn room, which has to be the darkest room in my house. It didn't occur to me that 1) it's a beautiful day today that 2) I could take pictures in the sunlight till I had already gift wrapped the sweater. Great job on the pea pod sweater. Nice color too. Hope your back feels better soon. What about Lucie? Has she gone by the wayside? What a sweet little sweater! I love the color. Itching to knit something Christmasy, huh? What are you thinking of? The sweater looks great! Congrats on another lovely garment. Which of the X-Men movie is your favorite? I think II is mine. Sorry you had a bad week. You should, however, be congratulating yourself on the pea pod sweater - it's absolutely adorable! Love your Pea Pod! It's fun to see all the different colors folks use. Pea Pod looks great. I'm working on it right now for a friend. I've actually been having touble with the leaves. I hope I have managed to sort it all out. I love that sweater! It's super cute! Your Pea Pod Sweater is really a beauty. What a great sweater. You defiantely find great baby patterns. Pea Pod is adorable! 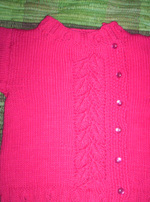 Quick knit as well. Are you looking for lots of quick knits for Christmas or one big "Hurrah" knit? And you have a knitting room? I design and I don't have a knitting room! Envy, envy. The sweater looks cute! I hate when the yarn requirements are off...grrr!